LONDON Britain's most senior Catholic cleric, Scotland's Cardinal Keith O'Brien, has resigned his position as archbishop of Edinburgh and St. Andrews amid allegations of "inappropriate behavior" just days before he would have taken part in the conclave to elect the next pontiff. In a statement released by the Catholic Church in Scotland on Monday, O'Brien said Pope Benedict XVI had accepted his resignation -- which he submitted in November -- and that he would not attend the upcoming conclave at the Vatican as he did not "wish media attention in Rome to be focused on me." "Approaching the age of seventy-five and at times in indifferent health, I tendered my resignation as Archbishop of Saint Andrews and Edinburgh to Pope Benedict XVI some months ago," said O'Brien in the statement. "I was happy to know that he accepted my resignation." The only allusion to the allegations of inappropriate behavior, which focused on his treatment of lower-ranking clerics, was a line in the statement in which O'Brien said: "For any good I have been able to do, I thank God. For any failures, I apologize to all whom I have offended." The Vatican has said all cardinals under the age of 80 are expected to attend, barring extreme circumstances such as health problems. In his absence, a total of 115 cardinals will elect the next pope. Reacting to O'Brien's resignation Monday, CBS News Vatican analyst Rev. Monsignor Anthony Figueiredo said the Church would need to conduct its work in a more open manner if it hopes to regain the public's trust. "I think we certainly need openness, because what is brought to light, becomes light," said Figueiredo, who is a director at the Pontifical North American College in Rome. He told CBSNews.com that there could be "no doubt that Pope Benedict was shaken" by the scandals which have engulfed the Church, and he was certain the cardinals would soon elect a new pontiff with the ability to deal with allegations of abuse inside the 2,000-year-old institution, "in a forceful way, to stop it happening again." O'Brien was had been taking advice from lawyers after British newspaper The Observer reported that three priests and a former priest had filed complaints to the Vatican alleging that the cardinal approached them in an inappropriate manner. The paper did not cite the names of the priests, but it said their allegations date back to the 1980s. "Cardinal O'Brien contests these claims and is taking legal advice," Peter Kearney, a spokesman for the Scottish Catholic Church, said prior to the resignation announcement. In the coming weeks, O'Brien, 74, had been expected to join the conclave of cardinals at the Vatican to elect the next pontiff, following Benedict's resignation announcement earlier this month. On Thursday, Benedict is to become the first pope to resign in some 600 years. O'Brien has not been the only cardinal to become embroiled in negative news as the papal election approaches. Across the Atlantic, thousands of people have signed a petition to keep California Cardinal Roger Mahony from the conclave because of revelations he had shielded sexually abusive priests. Mahony has made it clear he will attend the gathering and that no one can force him to recuse himself. In comments on the papacy made to the BBC on Friday, O'Brien said the next pope would be free to consider changing church policy on issues that were not "basic dogmatic beliefs." He said he believed that the requirement for priestly celibacy is not "of divine origin" and could be reconsidered. O'Brien also said it was time to think seriously about having a pope from outside Europe. He said he would be "open to a pope from anywhere if I thought it was the right man, whether it was Europe or Asia or Africa or wherever." 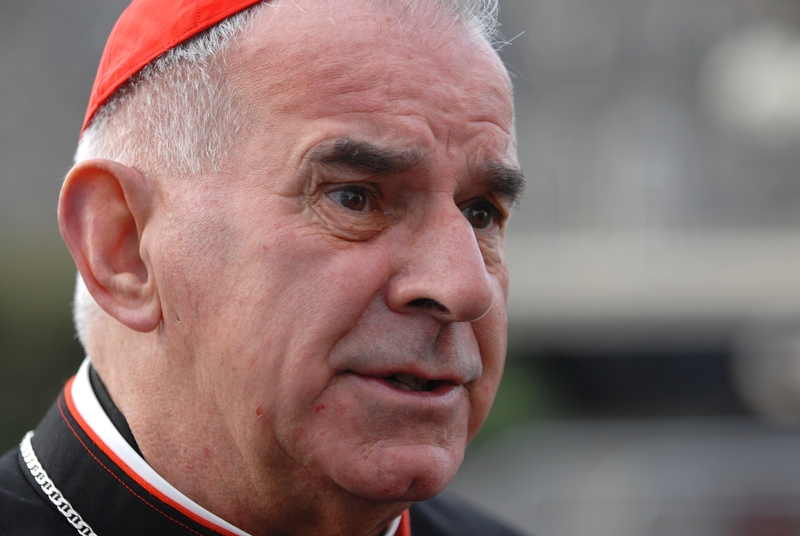 The cardinal is due to retire when he turns 75 in March.